The exhibition “GALLERIA DEL MOTORISMO, MOBILITA’ E INGEGNO VENETO – GIANNINO MARZOTTO” (Gallery of Motoring, Mobility and Talent in Veneto – Giannino Marzotto), unique and incredible, emphasizes the territory and the Veneto Region, land of worldwide firsts, inventions, nest for scientists and source of several scientific achievements, hard working and dynamic area which even today, thanks to its excellences, aims at being a point of reference for the World. The exhibition tells a story that for centuries was ignored, forgotten, diminished by technicians, scientists, administrators, while this Museum brought it back into the limelight it deserves. It is worth a visit to become acquainted with just a few of the World firsts and the people behind them, of whom Veneto can be proud since long ago, certainly every visitor will learn something he was unaware of, and a few might show off for being precisely from the area. 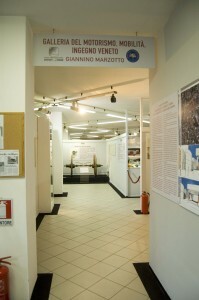 Precisely in these days, in the Visitors’ Book of the “Bonfanti-VIMAR” Museum, some wrote: “A different Museum, where the standing still of the exhibits becomes a run of emotions … a unique “piece” in the wide number of soulless museums”. Among the activities of the “Bonfanti-VIMAR” Museums there are also two classes per year for collectible cars and bikes restorers and a flea market, in October, called “Excellent wrecks”. We enjoy studying, restoring, preserving but among all we like to shock. We look forward to welcoming you here in large numbers, to tell a story, our own, that will certainly interest you. E-mail: info@museobonfanti.veneto.it, web site: www.museobonfanti.veneto.